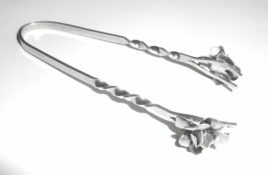 Art Nouveau Sterling Silver Repousse Sewing Scissors Ladies Accessory – Gorgeous 1900 antique early Art Nouveau turn of the century repoussed sterling silver fancy ladies scissors with lilies, honeycombs and raised flowers. 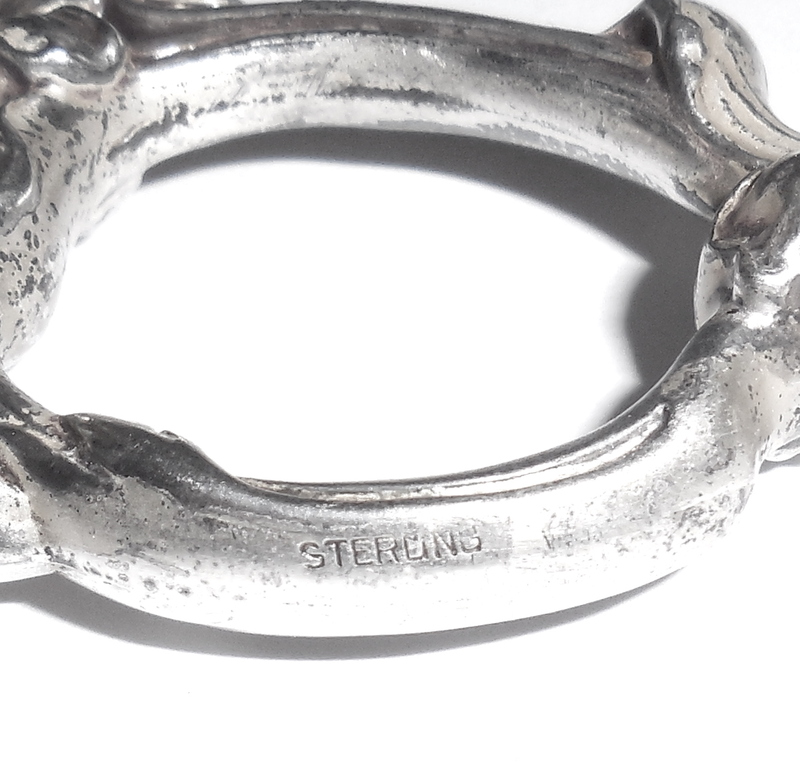 They are marked sterling, and Guaranteed sterling silver. The blades are shiny and silverplated rather than gunmetal or iron. They also have a spring design so when they are closed the blades bounce back. Hence, you will feel it if you are closing them too tightly. Size is 5″ tall by 3 1/2″ across the handles. Other than very little minor edge wear on the blades they are in excellent overall condition. Never monogrammed or inscribed. Completely original. No dents or dings. Never modified, repaired or altered in any way. 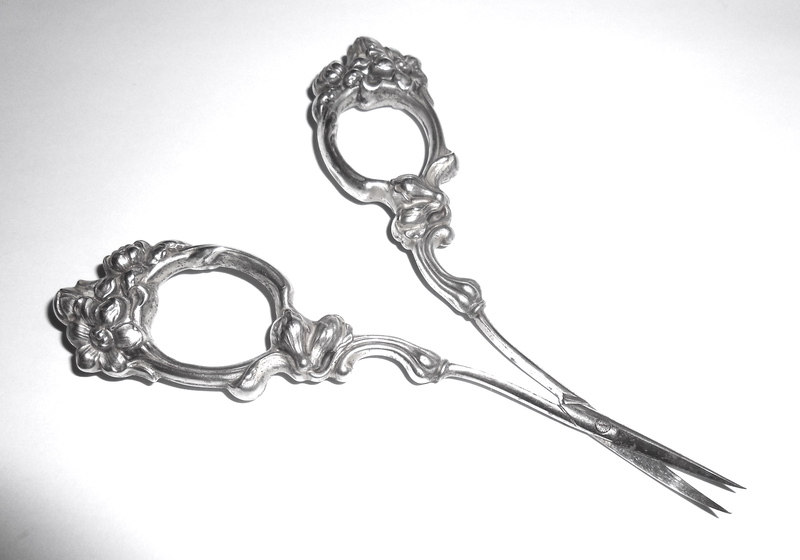 Part of an estate silver group of ladies accessories and sewing scissors that were very well cared for over the years. They are well made still quite strong, very little wobble between the handles. Blades are still very sharp. 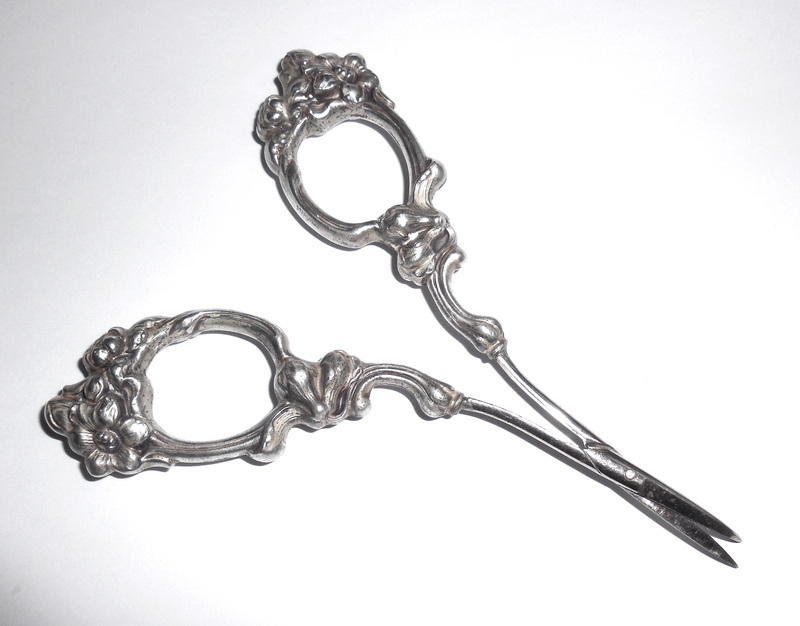 This is a gorgeous pair of fancy sterling silver scissors for any antique sewing and/or ladies accessories collection. They cut paper, thread and cloth easily. 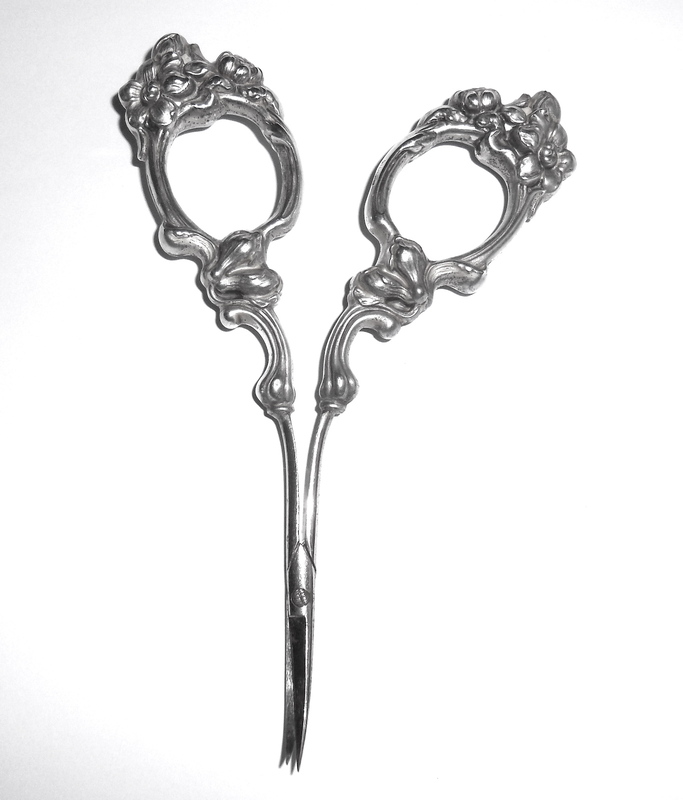 Antique handmade English Sterling Silver spoon with hand chased wings and crown top. 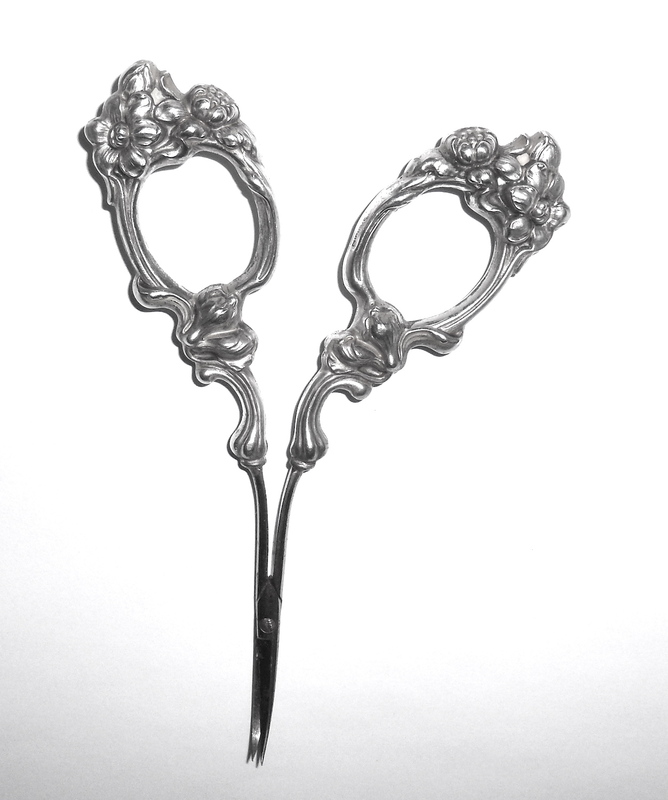 Made by Mary Chawner in 1834. See photo of hallmarks. Guaranteed solid British sterling silver. Other some very, very old age dings in the bowl it is excellent condition. Top has lovely hand chased work with a crown and wings. Size is 5 1/2" long. There is no monogram or inscription. 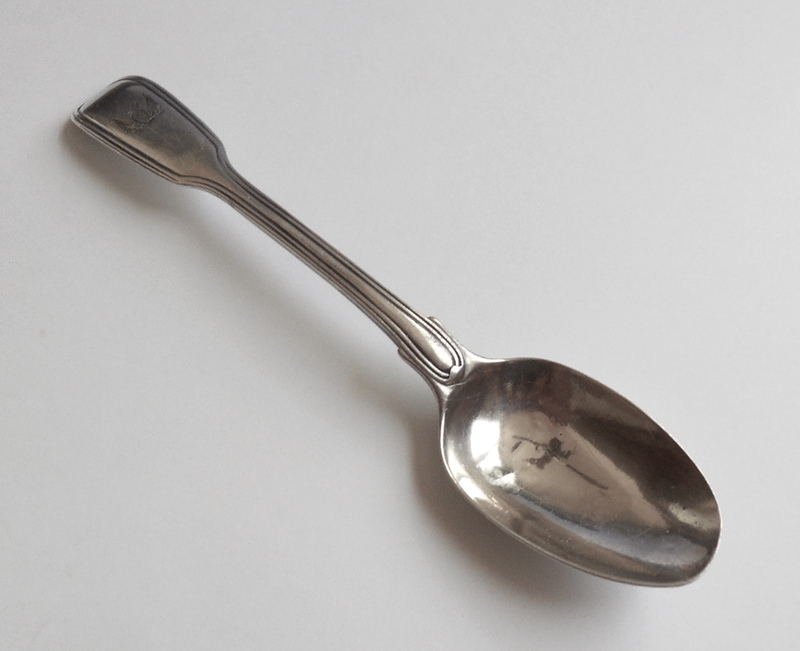 Very early spoon by an identifiable British maker for your antique silver collection. 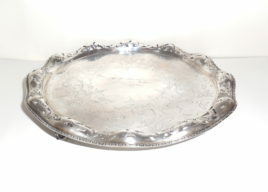 Antique 1853 Early Victorian Sheffield Silver Presentation Tray - This is a wonderful dated 1853 presentation tray which was presented from father to daughter in 1902. It has early hallmarks, see photo. Likely an early Sheffield mark attributed to Mappin Brothers who partnered with Samson and Sons in 1846. Beautifully chased it has large open fancy scrolls, long tailed long beaked elegant birds, fanciful leaves and lovely flowers. It also has a deeply scalloped border with pierced open work throughout along with very unusual feet that are very wide/broad and have a raised nut fruit pattern surrounded by raised balls within a thick scroll perimeter. Size is 10 1/4" across east to west, edge to edge. Height is 1 1/2" from the lower curve of the scallop down to the bottom of foot. Weight is 1.2 pounds or 16.4 troy ounces. Condition is excellent, gently used. No dents or dings but quite a few surface scratches. If you look at the open work edge you will see 3 tiny solder joints where this was originally soldered after the piercing was completed by the original silversmith or they are very early silver solder repairs. They look more like solder joints from the original making. There are also 2 tiny 2-3mm spots at the corner of 2 piercings that need solder repair. These are very tiny and minor. Overall condition is excellent. 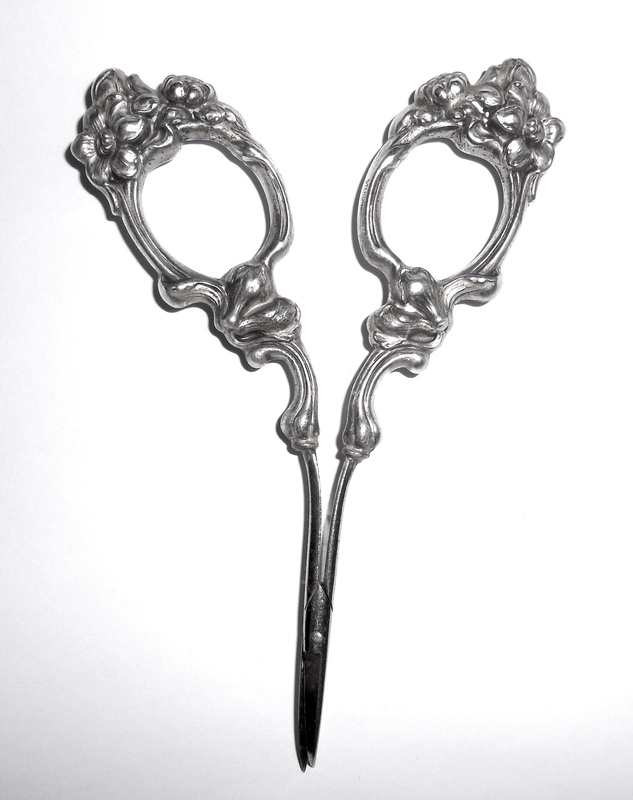 This is a gorgeous early dated presentation piece for your antique estate silver collection. 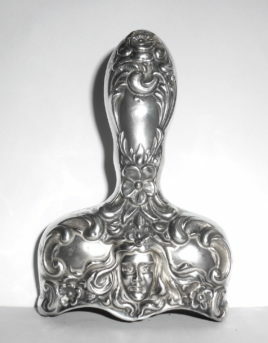 Antique 1900 Art Nouveau Sterling Silver Lady Face Handle Table Vanity - In a fairly large size this is a lovely original antique Art Nouveau Sterling Silver estate piece for vanity hairbrush or clothes brush or formal dining crumber or whatever ladies accessory you like. It measures 4" tall north to south from top of handle straight down to the bottom by 2.62" across east to west, side edge to side edge by 5/8" deep front to back. It was never monogrammed or inscribed. Other than one small finger dent on each side it is in very good condition. The lady is on BOTH front and back and beautifully detailed with noticeable flowing hair, carved eyes, narrow face and medium patrician nose. 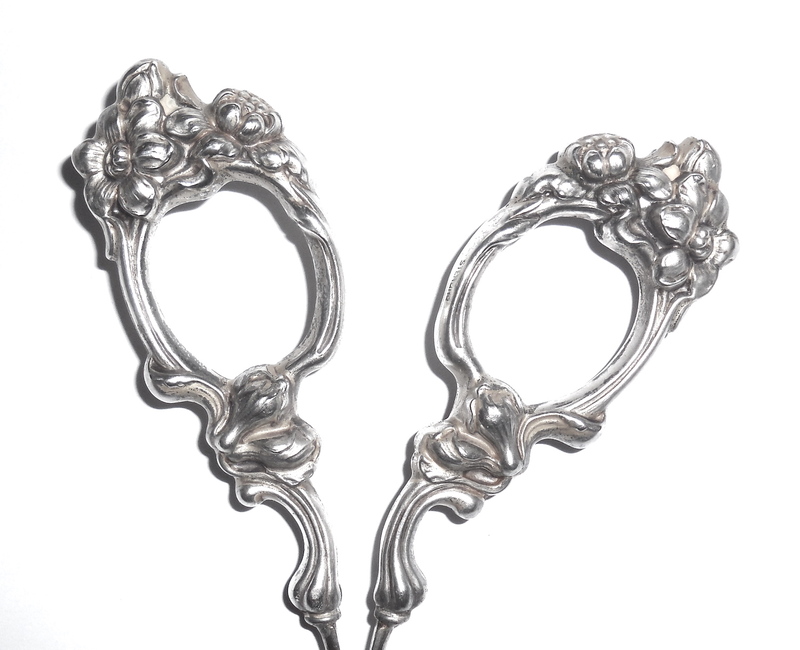 The entire handle is repoussed with draping scrolls and flowers that surround the face and handle top. 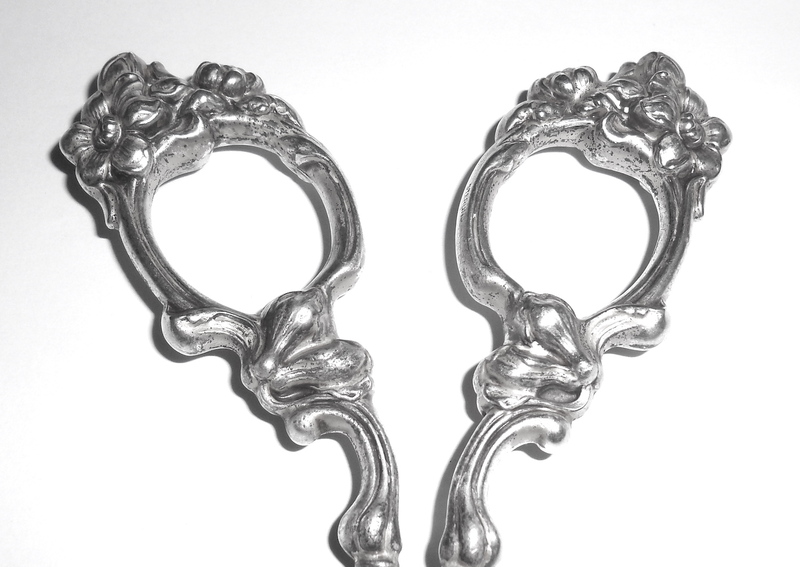 This is a gorgeous antique sterling handle to repurpose for your antique estate silver collection.